the superior vibration control needed in their projects! This is the famous Minus K® demo seen by thousands of visitors to Minus K’s trade show exhibits during the past several years. Others have tried to copy this demo but with little success, and that means our systems will enable you to accomplish what nothing else will. See below. The table is being vibrated mostly horizontally at approximately 5 Hz and an amplitude of approximately 1 mm by an attached shaker. Comparable isolation performance can be achieved vertically, but it is much more difficult to shake the table vertically. 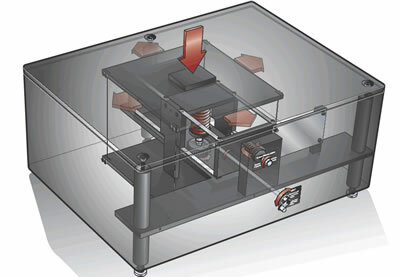 This demo cannot be performed with typical air tables or typical active systems because air tables provide little or no attenuation of vibrations at 5 Hz and active systems have a limited dynamic range and cannot handle large-amplitude vibrations. Minus K in the news!